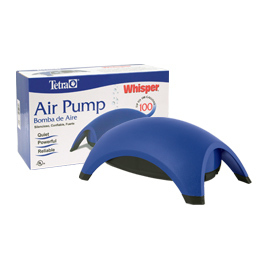 Tetra Whisper Air Pump has a patented dome shape and sound dampening chambers, which minimize turbulence and produce a smooth quiet stream of air. Wide footprint, rubber feet and suspended pump motor eliminates sound producing vibrations. Thick walls insulate motor noise. Powerful diaphragms provide ample airflow for deep water applications.